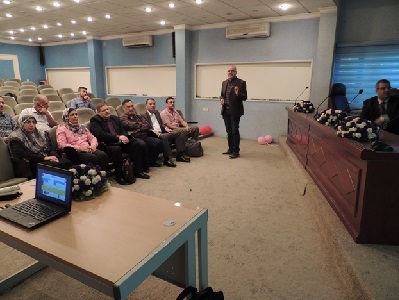 The Department of Control and Systems Engineering at the University of Technology held seminars for scholarships' students in the Graduate Hall at the presence of Asst.Prof.Dr. Hamed Mousa Hassan, deputy for Scientific Affairs and Asst.Prof Dr. Ahmed Ibrahim Abdul Karim the deputy Administrative Affairs. Asst.Prof.Dr. Safana Modhar Raafat Head of Medical Engineering Branch, Asst.Prof.Dr. Mohammed Yousuf Hassan,Asst.Prof.Dr.Salah Kazem Hamza and a group of lecturers and graduate students in the department. The researches of graduate students were reviewed and some notes were received by the lecturers. The seminars were held by Asst.Prof.Dr. Salim Khalifa Kadhim for his thesis: (Numerical and experimental investigation of the effect of induced vibrations on the mechanical heart valve). His research involved the use of bifurcated mechanical heart valves (BMHV) on a large scale to replace the original diseased heart valves. However, BMHV may fail for certain reasons such as plaque buildup and blood cell damage, leading to heart valve failure. Unknown causes of BMHV failure.